White-Ralph R., father of Theron A., Loyal M. and Vernal G White, and Cleona P. Davenport. Brother of Ella Sullivan and Will White. 10 grandchildren, 6 great-grandchildren. Services Wed. 3p.m. Greenwood Mortuary. Interment Greenwood Memorial Park. Services will be at 3 p.m. today in Greenwood Mortuary for Ralph R. White, 84, a retired Valley Center fruit rancher who died Saturday in an auto accident. White, born in Iowa lived in the county 26 years. His home was at 14345 Cool Valley Road, Valley Center. He was a member of the Southwestern Yacht Club and Valley Center Community Church. 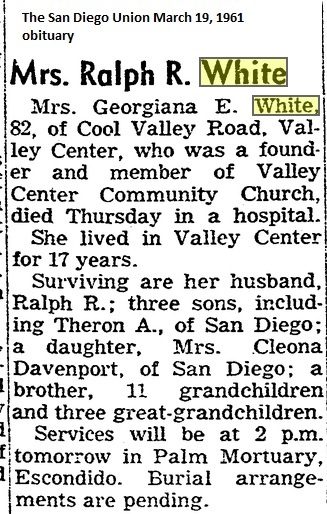 Surviving are a daughter, Mrs. Cleora (sic) Davenport of San Diego; three sons, including Theron, of San Diego; a brother, Will of Escondido; a sister; 10 grandchildren, and six great-grandchildren.